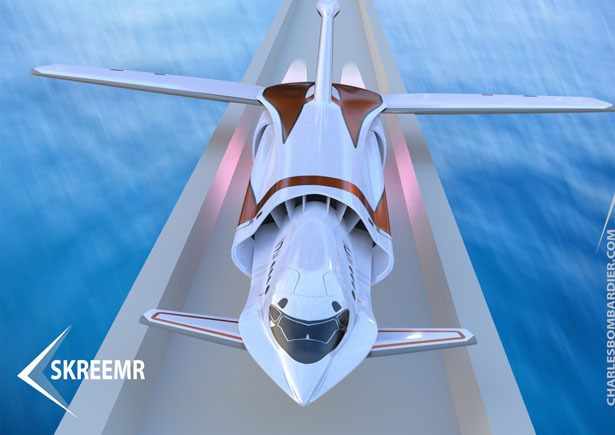 Skreemr is a concept aircraft that could be the future of high speed aircrafts, it is designed to be launched at very high speed thanks to a magnetic railgun launching system. 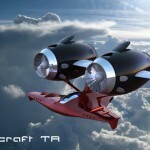 It is highly possible that we might be able to witness this concept turns into reality, right now, Scramjet engine designs are being developed by US and China. 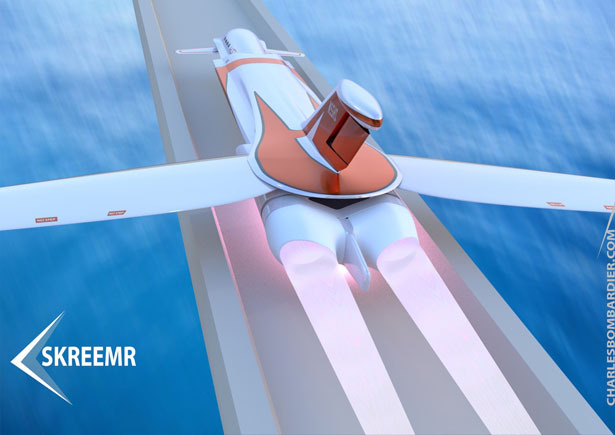 It might take years to see them on factory-built military drones, however, we believe that in not so distant future, these engines could be used to fly passengers across oceans at very high speed. 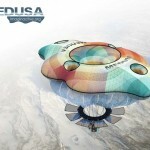 This project aims to spark your imagination around this idea, Charles Bombardier, the designer, has added the idea of using an on-rocket space launch system as well as conventional rockets in order to accelerate the aircraft initially. 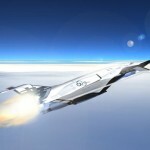 These rockets might be able to increase the aircraft speed fast enough to ignite its main scramjet engine, creating a possibility to reach a speed of more than Mach 10. 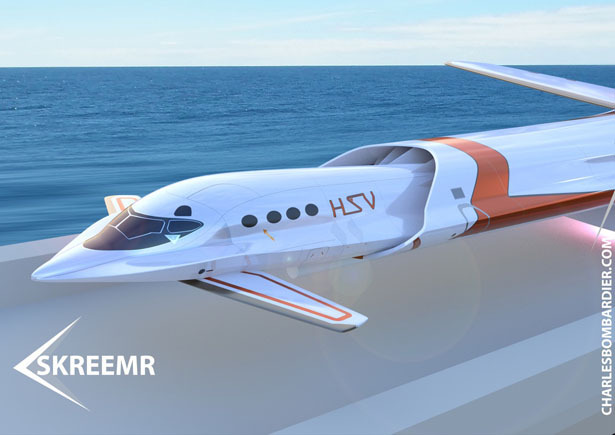 As explained by Charles, Skreemr would need to be launched from an electric launch system, because this is the only way to make it possible to accelerate the aircraft to a very high speed. 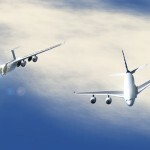 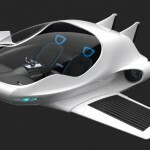 This aircraft needs to achieve supersonic speed without taxing the passengers with too much g-force. 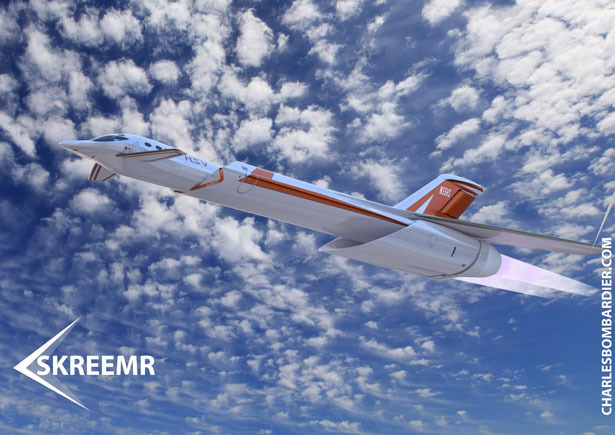 Skreemr ignites liquid-oxygen or kerosene rockets to rise up its altitude and reach the speed of Mach 4, then the plane would ignite its scramjet engine and burn hydrogen and compressed oxygen to continue its acceleration. 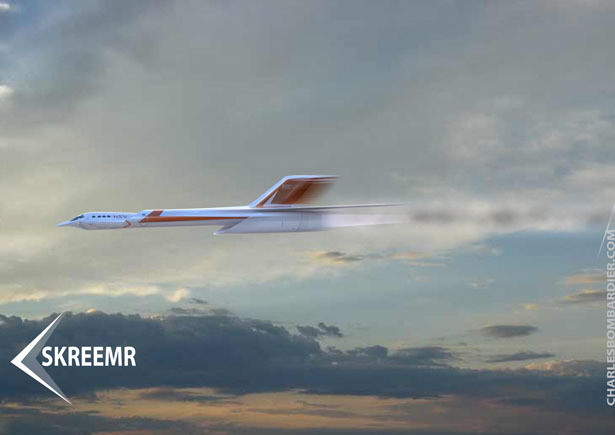 Skreemr would be a great commercial aircraft that can take us from one continent to the next in short time, it flies 5 times faster than Concorde and is able to carry around 75 passengers. 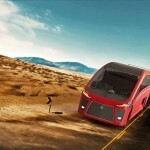 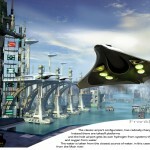 This entry was posted in Designs and Concepts, Jet, Transportation. 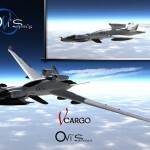 Tagged as futuristic aircraft concept, high speed aircraft concept, scramjet engine aircraft. 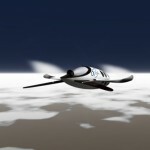 Or add rocket booster & use std landing gear for runway boost into Space aside MagLev track. 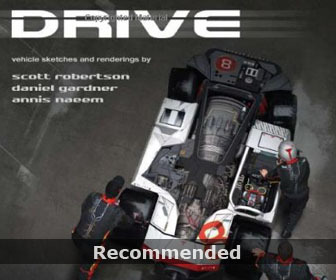 Id be awesome, test in So CA.